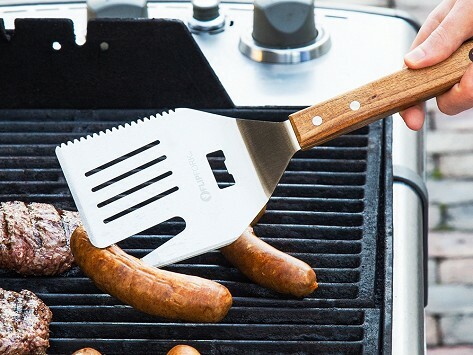 The BOSS grill spatula does not mess around when it comes to functionality. The sturdy stainless steel design has an extra-long wood handle and packs the must-have tools—fork, serrated edge, knife edge, and (the most important) bottle opener—into one heavy-duty spatula, streamlining utensil clutter and eliminating trips in and out of the house. Dimensions: 17.75" x 4.25" x 0.5"
My 1st time ordering from The Grommet............I saw this, and knew my brother in law, the grillmaster, would absolutely love it! Ordered it and it arrived really quick, sent out to him for his bday!!!! HE LOVES IT!!! BBQ's quite a bit, and his son in law now also wants one!!!! He is having to hide this 5 in 1 tool!!!!! Thank You so very much, love how you folks totally find "unique" items!!!!! I shall continue to shop with you!